Explore Hindu, Buddhist and Jain art from India, the Himalayas and Southeast Asia. Large numbers of terracotta animal or bird figurines, in many cases of Indian inspiration, have been found at Yotkan and other southern Taklamakan Desert sites. Fragments of appliqué decoration from vessels are also common. These examples were collected for Dr A.F.R. Hoernle shortly before 1900 by British officials in Central Asia such as Sir George Macartney, consul-general at Kashgar. Presented by A. F. R. Hoernle, 1903. Khotan, near the southern edge of the great Takla Makan desert, is in Central Asia. 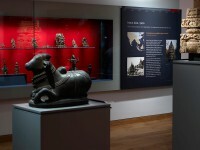 A few of the objects from Khotan and nearby sites such as Dandan Uilig and Yoktan, in the Museum’s collection have been included here for a number of reasons. Khotan is the nearest to India of the Central Asian sites brought to light by the great European explorers of the turn of the century; the expeditions to Khotan were mounted in India and Sir Aurel Stein, a Hungarian by birth but a naturalised Briton who made his career in India (and Central Asia) was Britain’s champion in the “Great Game” of Central Asian exploration and pioneer archaeology, along with the Swede Sven Hedin, the Russian Klementz, the German von le Coq and the Frenchman Pelliot. A much older connection, moreover links Khotanese artefacts with India; the terracottas in particular are largely of Indian inspiration when they do not derive in part, as does some of Indian art itself, from Hellenistic and Roman examples. Khotanese artefacts with India; the terracottas in particular are largely of Indian inspiration when they do not derive in part, as does some of Indian art itself, from Hellenistic and Roman examples. Khotanese artefacts, moreover, are not found in many museums, perhaps half a dozen artefacts, moreover, are not found in many museums, perhaps a half dozen in the world. Finally, most of the Khotanese objects in the Ashmolean, some one hundred and thirty, were the gift of DR A.F. Rudolph Hoernle, one-time Government Epigraphist for India, selected from his much larger collection given to the British Museum all of which pre-date the Stein expeditions. This is succinctly stated, as also how they passed into European hands, in an unpublished letter dated Oxford, 1 March 1904, to A.J. (later Sir Arthur) Evans, the excavator of Knossos and at the time Keeper of the Ashmolean Museum. Hoernle’s collection was acquired, on his instructions, by the British Agents in Kashgar, Leh and other outposts, on behalf of the British Government in India and sent to him in Calcutta where he was stationed. Some of the terracottas still bear the marking “M” and a number in ink referring to a particular package sent by McCartney, the best known of these men. It was upon realising the approximate source of such material that Stein mounted his first expedition. These terracottas, some in the round and none more than 3 inches or 7.6cm. in their largest dimension ([EAX.1 and EAX.12] are less than half that) are all marked by their spontaneity of modelling and a vivid sense of the droll. 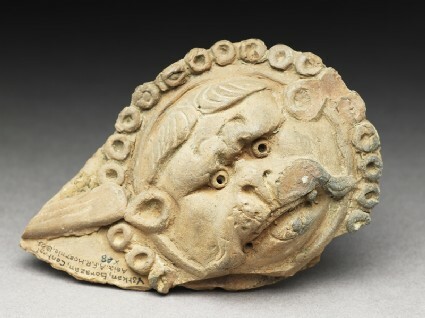 This includes the appliqué lion masks, detached from some long-smashed pots. From Iran to China, at this period, appliqué decoration was extremely popular, much of it, like [EAX.66, EAX.67, and EAX.68], ultimately of Western classical inspiration. An exception is [EA1984.26].